Bennie Lee Tucker, a.k.a. D.C.P. had a tough life, right from the beginning. At 3 months old, his drug addicted mother could no longer take care of him, so he was adopted by his Grandmother who had 11 kids of her own.D.C.P. loved to run the streets of Ft. Lauderdale, Hollywood, and Miami Florida. He was known throughout his "hood" for stealing, and petty crime. At the age of 16, he dropped out of school and began selling drugs on and off. His God fearing grandmother, however, never stopped telling him about Jesus.One day his life was changed forever. He went into Hallendale Barber Shop for his routine hair cut and met L.G. Wise. 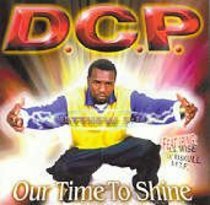 A well known Grapetree rapper, Wise told D.C.P. about Jesus in a way that was powerful and real. After an hour of hearing the Gospel, Christ's love was more than Bennie could resist.On the hair-riddled floor of that old barber shop, Bennie broke down and accepted Jesus Christ as his Lord and Saviour! "I've never looked back since", Bennie proclaims. Now as D.C.P. (Demon Cap Peela), Bennie proclaims his faith to the world on this his third release, "Our Time To Shine". About "Our Time to Share"